Strangely I can get Generals to work just fine, but Zero Hour won't launch, it simply minimizes a second after it starts. Also, the main menu background is just a picture. How do I make it "animated", like I remember it? Well, I've not been able to get C&C TFD to run. I've tried the options.ini fix and all of the compatibility fixes. The game isn't hanging, though... it's not recognizing the DVD. It gets to the TFD start screen and when I select a game (say, Generals), the splash screen shows up and then it asks to insert the DVD. The DVD is in the computer and it's a paid-for copy. I've seen a couple others have this problem, but as yet have not heard of a fix. I have a HP i7, with 8 GB ram and 1GB video card (ATI Radeon HD 5570) and am running Win 7 Home Premium (64bit). The patch, among other things, removes the need for the DVD, all games affected. 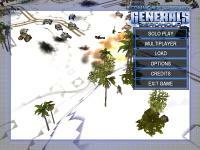 Went through some old games and found my Generals games and thought i should give em a try. Thank god for this thread! I was mad! when the game didnt work. Just followed the advice of rtsking117. But i still didnt get it to work. Then someone said you gotta remember to actually get it to be a ".ini" file. So i went to the control panel and found the tab for files and folders and checked off "hide real file extensions" and finally got a .ini file. Now everything works fine, Thanks!!! I'm having one of the problems that has been mentioned once or twice in this thread, which is that I can launch Zero Hour and I can start a Solo Player Game but after about 5 to 20 seconds, depending on which scenario I pick, all buildings and Dozers blow up. I've tried all of the suggestions posted, re-installing both Generals and Zero Hour to C:\Games (including patches for both), making my INI files match the INI entry previously posted (as real INI files), XP Compatibility Mode and all. I even installed Global Crisis. I have a couple of observations to add to those previously posted that I hope will help jog some other ideas. The problem I'm having only happens if I do not select the Challenge scenarios of Laser General and Camouflage General. If I pick either of those two, the game plays just fine. It's making me crazy. I'm wondering what the magic variables are. Between people that are having this same issue and not, I've noticed some differences in Radeon vs NVidia. I have Radeon ... Win7 Ultimate. Also, I'm using original CDs, not The First Decade. I wonder if that makes a difference. Oh interesting! ... As I was writing this I noticed that the Israeli Challenge works! It looks like all Challenges work that are AGAINST the US Air Force General. I just tried a Skirmish against Granger but everything blew up in 15 seconds ... GAH! I hope someone can help me figure this out. Try installing Gens and ZH in a directory different to the one you mentioned, as some files might have stood still after the uninstall. Also, try setting the compatibility mode for WinXP SP3. You might also be playing a pirated version with a lousily cracked EXE. If the game is legal, you can only reinstall and use the latest patches for both Generals (1.08) and Zero Hour (1.04). If it isn't, then there's nothing we can do. One PC, two OSes: WinXP Pro SP2 and Win7 Ultimate SP1. Both OSes have latest Nvidia drivers and directx_Jun2010_redist installed. Generals ZH running perfecly on WinXP. On Win7, game runnning normally also, except one problem: terrain textures (grass, sand etc.) appears solid white in any map. Roads and buildings look normal. I tried everything: options.ini editing, compatibility modes, re-installing DX and Nvidia drivers, even downgrading drivers to ver. 197.13 (current is 280.26) - no luck. So, what can I do? Thanks in advance! Patching ZH to 1.04? Reinstalling the entire game? Checking for lousy No-CD cracks? Does your video device in the W7 box have any issues otherwise? Are the in-game settings set higher than sweet **** all? Need more information. No, no issues in other games or applications. Its GeForce 6600 (office PC, but capable enough to run Win7). No lags, all running smooth, except wrong texturing ONLY in Generals (and Generals: ZH, and Generals: Desert Storm). I tried different settings both in Nvidia Control Panel (Let the Application Decide - Performance - Balanced - Quality) and in game (different resolutions and detail levels). Changes are applied like it should be, but ground is always white. In XP ground always look correct regardless of settings (can't reproduce the bug in XP). And, I did not use any graphics tweakers or such, just WHQL driver. Well, reinstalling or patching may be the only way out. I think that Red Alert 3 has the same issue (with the terrain black instead of white) when the version in question isn't compatible with Worldbuilder. You say this happens on all maps, both stock and custom? Is that copy of Zero Hour pirated? On some occasions, whether a game is pirated or not is important. Pirated games have their own bugs, glitches etc. due to copy protection overrides and lousy file distribution. Insert the first Zero Hour disc into your drive. In the autorun click "Explore CD". Open Data1.cab with Winrar. Find Textures.BIG inside the file and extract it somewhere you'll easily browse to. Close everything and run FinalBIG. Browse up to where you found Textures.BIG and open it. Scroll down until you see files from TGCobble01.tga to TXConc07a.tga. Extract them one by one to (your Zero Hour directory)\Data\Data1\Data1Terrain_big\ (as you can see, you'll need to make two new folders). Tell me if this works or not. By the way, Desert Storm, being a mod, is not involved in any form of piracy. Mods aren't illegal, and are sometimes even encouraged. Try one more directory. Move all those texture files I told you to (your Zero Hour directory)\Data\English\Art\Textures. The Art subfolder isn't normally there, so create it. Does the same issue persist without the mod on Windows 7? I can say for sure ZH works fine on W7 since that's what I have.